Do you love acting, drama games and all things thespian? Then please try out in our OPEN AUDITION for Jakarta Players' 50th anniversary production! 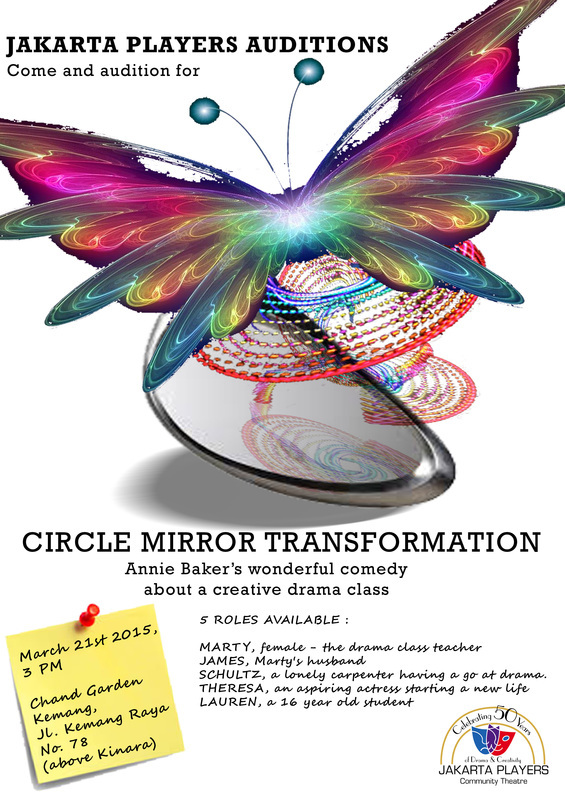 In June we will be putting on a production of Annie Baker's CIRCLE MIRROR TRANSFORMATION, a wonderful play about four students and their intrepid teacher working through a series of Creative Drama workshops, growing and changing in the process. It's a great chance for you to act or help out back stage in a play that the New York Times called, "absorbing, unblinking and sharply funny." Theresa, an aspiring actress who's recently moved away from New York. Younger than Schultz. We would also be delighted to welcome anyone interested in helping out with set design and construction, lighting, sound, costumes or props -- anything that tickles your fancy! The play will be directed by JP President Andrew Trigg. Rehearsals will be a fun and a slightly whacky experience, because the play is filled with drama games and activities as part of the story. It's going to be an enjoyable ride - and an opportunity to learn a bit about creative drama! Please come along and try out!